this week has been alot of awesome and alot of not-so-awesome all wrapped into a few short days. as the not-so-awesome is a total downer that nobody wants to read about, i'll just suffice it to say that my headteacher and i had a misunderstanding (over something totally stupid. of all things -- milk!) and she got really mad at me. hahaha. which really isn't that uncommon here because koreans can be pretty temperamental about minute details. i think we're ok now, but it was shaky for a short bit. drama-rama. pray that that dumb spell blows over quickly! last saturday, a friend from church invited me to her house to cook korean food. i was so excited! hyeon-hee is a really sweet woman (maybe in her 30s?) who lives really close to KNU and actually works on campus. she picks me up and drops me off every sunday for church. her english is a work in progress, as is my korean, so communication can be really difficult at times. at first it was kind of awkward, but we have developed a really neat relationship over the past couple of months to the point where we are really comfortable in the silence. there are sometimes long stretches of time where we don't verbally say anything, but it's totally OK. in a really loud world, i have come to really cherish this friendship. we work out language when necessary, but do without when possible. we spent several hours together on saturday, and it was really enjoyable -- almost soothing. we prepared 2 dishes: kimbap & rabokki. (refer to older posts for pictures + descriptions). the kimbap requires rolling a bunch of ingredients really carefully into a seaweed wrap. i was terrible at it and hyeon-hee got some good laughs out of watching me struggle. hahaha. i improved as the day progressed, but i was still really bad by the time we finished. gotta work on that, for sure. we had a great time together and the food was absolutely delicious. she asked me to come back next month to make japchae with her. really looking forward to it already! 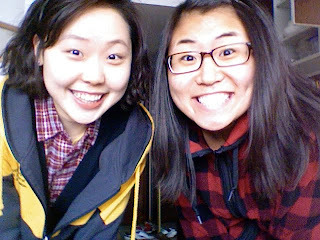 saturday evening, i was able to meet up with a new korean friend for tea. song-hoon and i were introduced through some mutual friends several weeks ago, but had not been able to coordinate our schedules to work out a second hangout until almost an entire month later. (pathetic!) he stays really busy as a 3rd year religion major at KNU and my workload has picked up a bit between my 2 schools, so time is tight. the first time we met, he talked only a little and was a tad shy, so i really thought that his english was minimal. i was 200% wrong. when we met on saturday, he started talking immediately and didn't stop for the entire duration of our 3-hr teatime. hahaha. i was amazed! his english is really, really impressive...and mostly self-taught. he watches 20 min of CNN everyday to practice his listening skills, and in the process, has picked up alot of news about america. he initiated a really in-depth conversation about president obama and the new healthcare plan...i was so shocked that my initial response was laughter. he looked at me like i was crazy and i just said - "song-hoon...i think you know more about america than most americans!" i was seriously impressed. we had a really great time talking about all kinds of things, and i was really interested to hear his opinion on some american hot topics. he made some really great points and had good insight...i could tell that he had really thought it through. we are hoping to get together again once he recovers from his current ailment. he did a serious prayer fast over lent (i hope it's ok to share this???) and has since had some significant health problems. he dropped alot of weight (10 kg...over 22 lbs!) and his stomach doesn't really know how to handle food anymore. please keep him in your prayers the next couple of weeks as he works to return to good health. his english is good enough that he has picked up on a few idioms. at one point in the conversation, i was telling him about how all of my friends here say that i am becoming more korean with every passing day. it's getting to the point where they really can't distinguish me from the other koreans in a crowd. hahaha. it's kind of sad, but mostly hilarious. i always have to yell or call them to get their attention. anyways, song-hoon and i were laughing about it and he said - "what is the expression? act as romans?" i started laughing and explained the background of "when in rome..." to him. you know you're getting good at a 2nd language when you can correctly apply an idiom to the situation! this is a good time to insert a note about korean culture. in america, you can generally estimate one's life stage by knowing their age. for example, most people my age are just finishing college or beginning a new job. maybe relocating for work or beginning their marriage. this is not the case in korea. age is no indicator of what stage of life a person might be in. a 22 year old could just be beginning university or already working a professional job. and korean males are required to serve 2 years in military service...but they may choose when to serve it. this also throws off the age/life stage thing because some choose military before university, and some choose after. for example, song-hoon chose to serve his military time prior to entering university. so (in korean years...which are TOTALLY different from american years!) he is 27 years old...but still in university! it's totally normal in korean culture. so a 27 year old could still be in the college stage, while a young-un like me is already working a professional teaching job. it's really confusing! i had a really funny experience on monday. many of you have heard about or even met my friend, ben. he was one of the first friends i made at trevecca freshman year and we remained close all throughout university. he's like a brother to me and has come to visit my home in ohio several times. he came to korea earlier than john, patrick, and i...back in sept 2009. he works in a different program than the rest of us, but in the same city. it's called an english village, and is like an intensive english camp. students go there for a week at a time to receive training, so he sees a new group of students every monday. anyways, i knew some of my students were going to be gone from my classes this week, but i didn't really know why. you don't often get alot of details here, so you just learn to deal with the information gap and eventually stop asking questions. come to find out, my kids were at ben's english village for the week. what are the chances?! there are so many schools and so many english villages in cheonan - it's really unbelievable that something like that would happen. ben was talking to his first class on monday, getting to know them, etc, and he asked - "what is your english teacher's name?" and they all answered "miss whitney!" he started laughing in disbelief and said - "is she a korean american?!" since they are 5th and 6th graders with less than exceptional english skills, they all answered - "no!" hahaha. confused, ben asked - "is she white?" and they replied - "no!" really baffled, ben said - "well...what does she look like?" they thought about it for a second and started looking and pointing at each other and said - "she looks like us!" hahahaha. my kids are hilarious! ben started laughing and explained that we knew each other and had been 친구 (friends) for a long time. korean kids' reactions to most things will be laughter. but not a chuckle. more like pure hilarity and chaos. he said they started screaming and laughing their heads off til they were really out of control. and when he said "friend," they all inferred "girlfriend," which only added to the insanity. all kids love to think they have a handle on their teachers, like personal details about their life, so i can only imagine what i will have to deal with this next monday morning. hahaha. i expect my desk to be completely swarmed with 35 crazy, giggly girls who will want to know all about "ben teacher." it's gonna be nuts. there is a long and unnecessary story behind this picture, but here is another shot of me & soo-in. she and i met just a little over a month ago, but quickly became really great friends. i have mentioned her several times before. she is a university student studying english literature, and her english is AMAZING. really! so impressive. she is near and dear to my heart and we spend alot of time together now. we are planning a trip to a strawberry (딸기) festival tomorrow, weather permitting! please write/email/facebook as you find the time. i really, really, really love to hear from everyone back home. take care and have a good week, ya'll!